We've been through this rumor mill before, Fools. Offshore drilling is still in rough seas. Seadrill may need help that's not there. Image source: Getty Images. Shares of many offshore drillers declined again in October, but Seadrill Ltd (NYSE:SDRL) shares were easily the most volatile of the major drillers in the month, falling sharply early, only to shoot up sharply on speculation before steadily declining again by the end of the month. The key behind Seadrill's much sharper upward move -- and then the hard fall back to earth -- is similar to something its stock went through earlier this year: Rumors that founder and largest shareholder John Fredricksen was positioning himself and his portfolio to loan the company money, in this case as much as $1.2 billion, early in October, only for nothing to happen to substantiate those rumors as the month went by. As for the decline that drove Seadrill and its peers Transocean and Noble Corp down? In short, more of the same weak demand and oversupply that's swamped the offshore drilling industry for nearly two years now. Oil prices fell about 4% in October as global supplies and output continue to remain higher than demand growth can adsorb them. 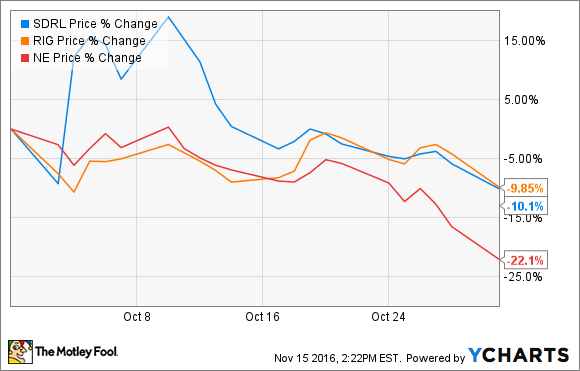 The continued malaise in offshore drilling was behind Noble Corp's decision to eliminate its dividend late in October, and it was a key reason its stock price fell more sharply than Seadrill's or Transocean's. The move will save the company around $20 million in annual cash outflows. Noble Corp reported third-quarter results on November 3, confirming how bad things are. The company said utilization of its floating vessels was 41%, down from 51% (a bad number in its own right) in the second quarter. And while this was partly due to more non-operating days on contracted vessels, it was largely the result of expiring contracts and the early cancellation of contracts on vessels without any new work available. On the other hand, its jack-up vessels have had better success, with 80% utilization in the quarter, only slightly down from 83% in Q2. Transocean reported its third quarter on November 2, also delivering sequentially lower revenue and operating results. Transocean reported total fleet utilization of 49%. And while this was slightly improved from 47% sequentially, the company earmarked more vessels that it would either scrap or idle during the quarter. The offshore industry is a mess right now, and it remains -- as it has for more than one year -- unclear when it will start to recover. While it will eventually bounce back, we are in the midst of the worst downturn in offshore drilling in decades. And considering that offshore is one of the last segments to see investment in the oil cycle, there are very likely going to be further casualties. 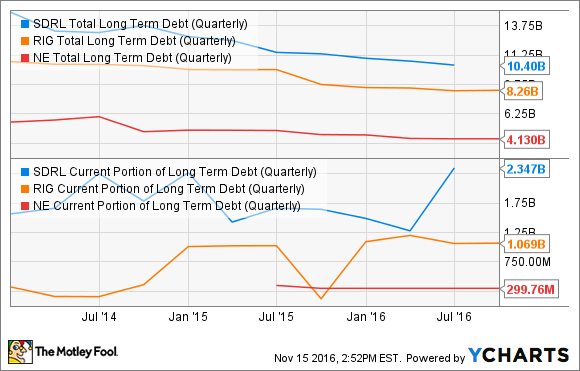 SDRL Total Long-Term Debt (Quarterly) data by YCharts. As you can see above, Seadrill is by far the most exposed in the short term, with nearly $2.4 billion of its debt coming due within a year (actually by mid 2017). Transocean, on the other hand, has less than half of that due, has a much smaller base debt currently, and has recently demonstrated it can access liquidity, closing $600 million in long-term debt in October to finance the construction of an ultra-deepwater drillship. Noble Corp, while being the smallest of these three, is also the one with maybe the most financial flexibility. It has less than $300 million in near-term debt expiring, over $400 million in cash, and $2.5 billion available in revolving debt. Offshore is still a mess. Are you willing to bet on Fredricksen? While Transocean and Noble Corp will continue to struggle along with Seadrill, their financial paths forward seem to be much clearer, while Seadrill's future may indeed require financial intervention from its biggest shareholder. The catch? There's no guarantee he acts in a way that benefits common shareholders at all. With that in mind, and considering the awful state of affairs across the offshore segment, there's little reason to rush into any of these stocks at this point. While Transocean and Noble Corp both seem to have less downside risk than Seadrill (even with Fredricksen potentially in its corner), there's just not a lot of justification to investing in offshore before there's some sign that the worst is over. And we aren't there yet.